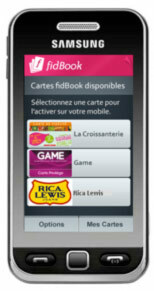 FidBook, the first NFC application enabling easy-load loyalty cards on a NFC phone is launched in Nice. We all know that NFC offers the opportunity to have multiple contactless services on one mobile. Those Services are independent applications of different providers (Banks, Transport companies, Retailers etc.). But in addition to that, transport and payment services consumers are eager to use NFC phones as a wallet for loyalty cards and coupons. So AIRTAG are announcing their (drum-roll) “FidBook” – a simple NFC application enabling loading and management of loyalty cards on an NFC phone and thereby providing the advantage of coupons, discounts and premium services at participating retailers. The service is being launched in Nice by Orange, SFR, Bouygues Telecom and NRJ Mobile. Participating retailers are La Croissanterie, Game, Rica Lewis and more coming soon.